Having covered 45 kilometres from Quintanar del Rey to Albacete on Tuesday evening, January 22, at 7.00PM Our Lady of Częstochowa stopped in front of the cathedral of St. John the Baptist in Albacete, the capital of a province in the region of Kastylia-La Mancha. At the entrance the Mother of God was welcomed by bishop Ciriaco Benavente Mateos, the metropolitan bishop of Cuenca Diocese. Next he led Her in a solemn procession into the church. The cathedral was full (around 800 people). The bishop presided over the Holy Rosary in the intention of the defence of life and family, and then presided over the Holy Eucharist, which was also attended by the representatives of the local authorities led by the Mayor of the town. In his homily bishop Benavente strongly stressed the necessity to take up the protection of conceived life. After the Holy Mass the Icon of Our Lady of Częstochowa was taken to the side altar of Virgen de los Llanos, the patroness of the town. Last year the 300th anniversary of Her cult was celebrated here. 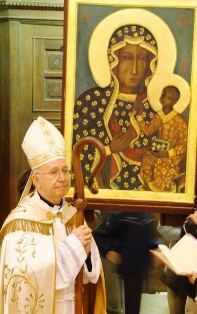 At this chapel with both images of the Mother of God, Bishop Benavente dedicated the town of Cuenca to the Virgin Mary and, on behalf of all the inhabitants, pledged to protect human life. The congregation sang „Tantum Ergo Sacramentum”. Next, the Black Madonna, led by the Bishop, with an orchestra playing, went in a candle-lit procession along the streets towards Capilla de la Adoracion (the chapel of adoration). At the chapel the Most Blessed Sacrament was exposed and an adoration started. It lasted all the next day. In the morning, January 23, the Holy Mass was celebrated by the vicar general of Albacete Diocese. During the day the students from many schools came to pay homage and pray at the intercession of Our Lady of Częstochowa (around 800 people). At 9.00 PM young people representing the town and diocese of Albacete bade farewell to the Mother of God who left for the pilgrimage town of Caravaca de la Cruz.